Another day, another milestone: According to blockchain.info, the total number of Bitcoin transactions per day broke 100,000 today (using blockchain.info’s metric, which excludes transactions to outlying addresses). Obviously, this is good news (and highlights the need for a solution to the miner bandwidth problem that both sidechains and treechains attempt to address). There are, however, some caveats. First, as Peter Todd points out, the transaction fee for Bitcoin is not that high. Generating this sort of spike in transaction fees by just bulk-sending minimum transactions would cost less than a thousand dollars. Furthermore, there are other reasons to believe that the growth of Bitcoin adoption, while relatively fast by the standards of most other financial technology, is slower than this spike might lead you to believe. As CoinDesk reports, other metrics that ought to correlate (including the total amount of time the spent Bitcoins have been idle, also known as ‘Bitcoin Days Destroyed’) do not reflect the same spike. According to CoinDesk, based partially on the analysis of Tim Swanson, the new transactions are probably associated with various Bitcoin 2.0 technologies, as well as the recent phenomenon of Blockchain spam. 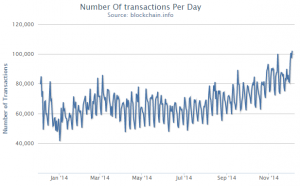 Regardless, it seems likely that the underlying growth of commercial Bitcoin transactions is not the cause of the increase. On a related note, since transactions per day have been increasing for a while without a corresponding rise in price, this represents yet more evidence that the current (relatively stable) price is still above what’s justified by commerce. A tighter correlation between commercial transaction volume and price, if we ever get it, will be a strong indicator that Bitcoin has reached a point of true stability.